Hello Students or those considering studying and furthering their education! 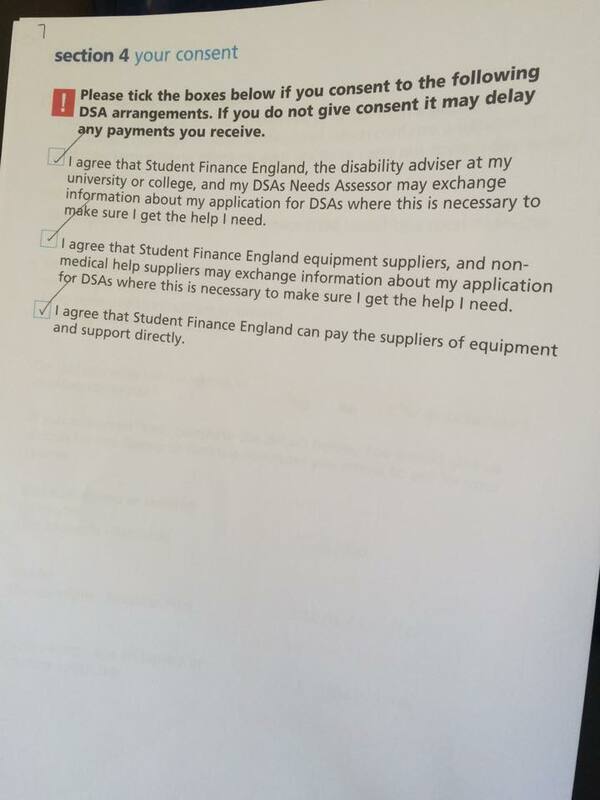 You are likely eligible for the Student Finance England (SFE) Disabled Students’ Allowance (from here on it is called DSA) if you have a chronic/long term medical issue. I myself have funding and equipment given to me by this wonderful resource and you could be eligible too! When I was applying for this in my first year I found the process daunting, I couldn’t find guidance anywhere but never fear I am here to help you apply! Just call me Super Beth!? I have been through this process before and because of complications out of my control and SFE’s it took a while to get processed but I’ve heard from others how swiftly SFE worked with them to get this all done smoothly. Here I will write a step by step guide to filling out the FULL application and SHORT application with photos as a visual guide! So.. questions from my students? 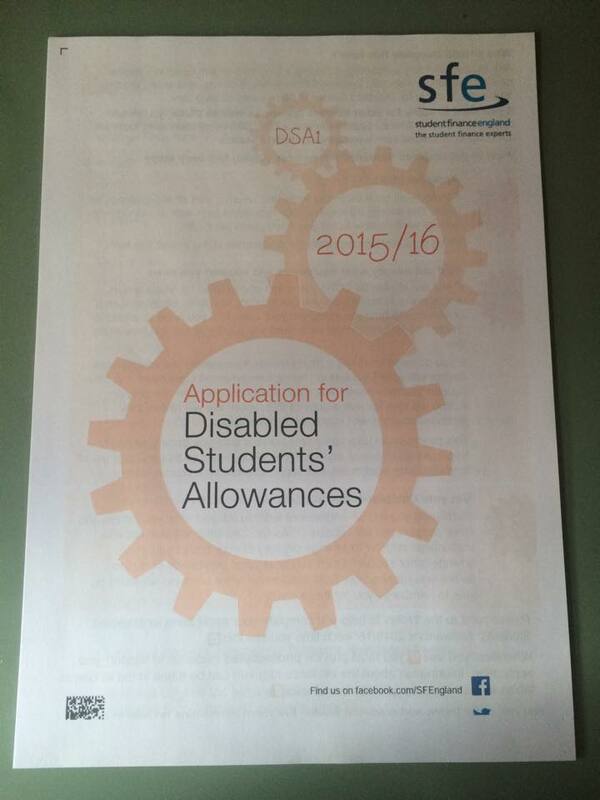 The Disabled Students’ Allowance is funding, typically in grant form, which can offer students studying with disabilities, learning difficulties and/or long term health conditions financial help to help them stay in education. 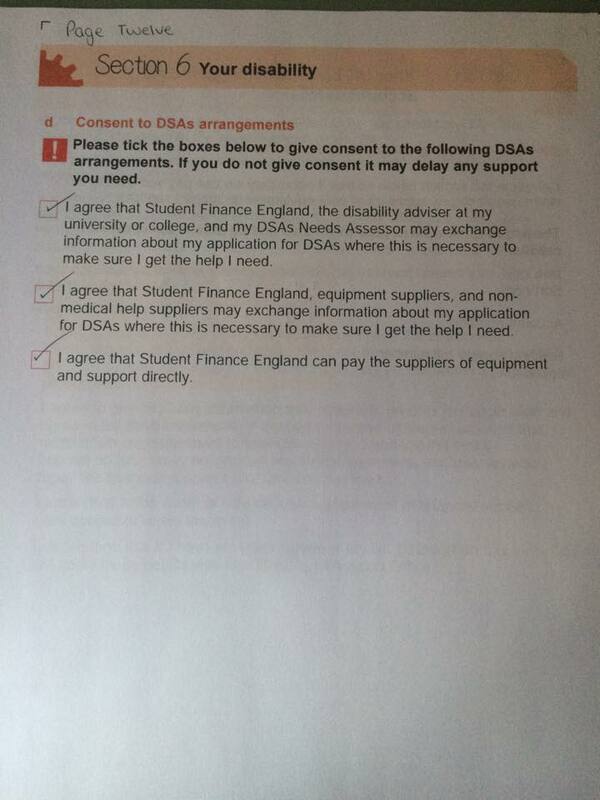 Who is eligible for DSA? Specifica learning difficulty, e.g: Dyslexia. 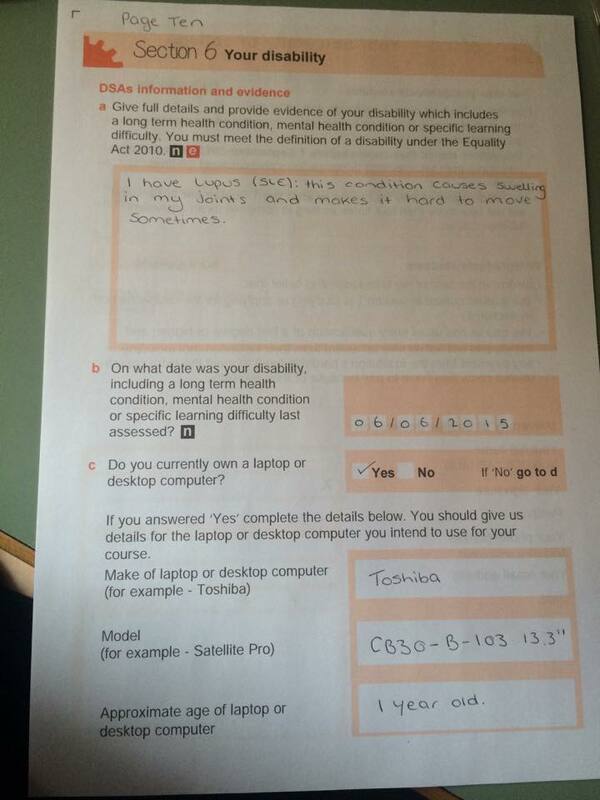 SFE’s website also states that you must meet the definition of Disability under the Equality Act 2010. What can I get from DSA? Specialist equipment; e.g. a computer if you need one because of your disability. Extra travel because of your disability. So all I need to fill out is a form and it is done? What is the difference between the Full DSA form and the Short DSA form? 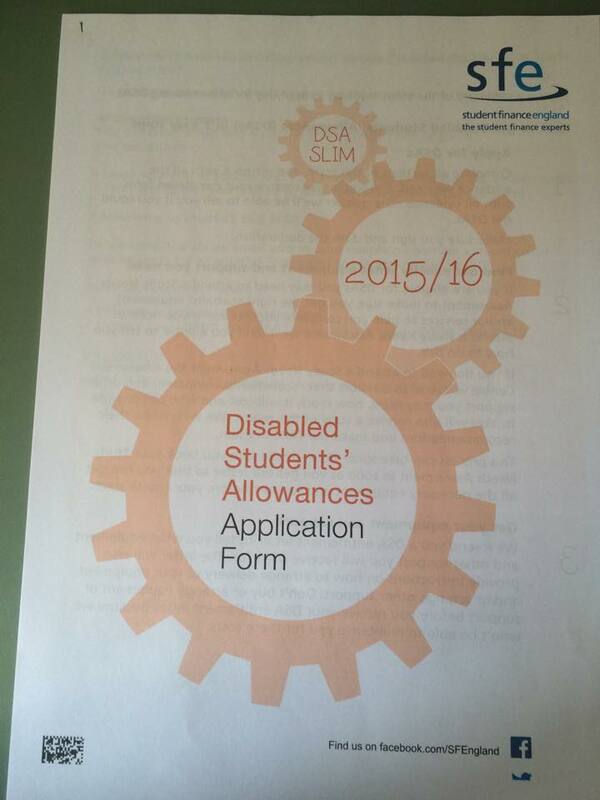 If you are applying for only DSA and are post graduate or a part-time student you should fill out the Full DSA form. If you have already applied for Student Finance (such as student maintenance loan and tuition loan) and want to apply for DSA you should fill out the Short DSA form. Do I have to reapply each year for DSA? Yes. 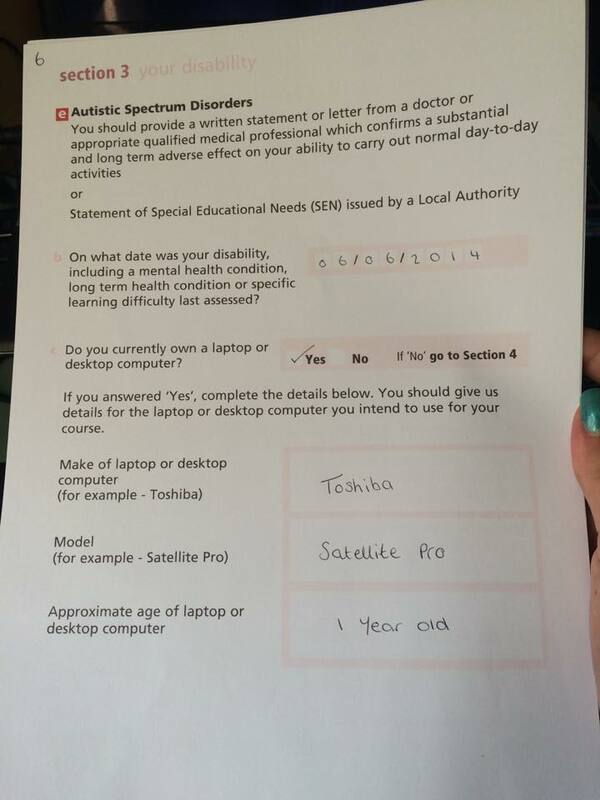 I have reapplied by using the Short DSA form and sent it to the address on the back of the form with evidence of my disability. Beth, what are your experiences with DSA? My personal experience with the DSA grant has been a very positive one. While it took a while to get processed due to doctors getting evidence to me and personal problems beyond my control and SFE’s control everything has gone very smoothly since then. I was very comfortable with my needs assessor, it has been a long time since we met and I cannot remember her name (Lynn seems to be in my head) she was very understanding and had answers to all of the questions I had! I received equipment to help me in classes, such as a Dictaphone and I have funding to have a member of support staff from my university disability department write notes for me in class to save my poorly hands from aching! 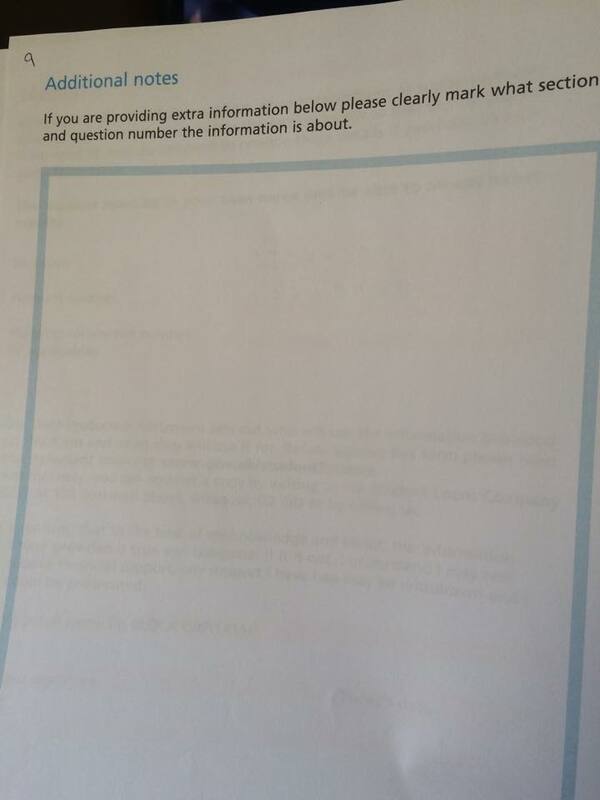 About a month after my needs assessor and I met I was sent a letter by SFE detailing my entitlements and telling me that they had allocated me a certain amount of money in reimbursements for things such as taxi journeys to university and back. 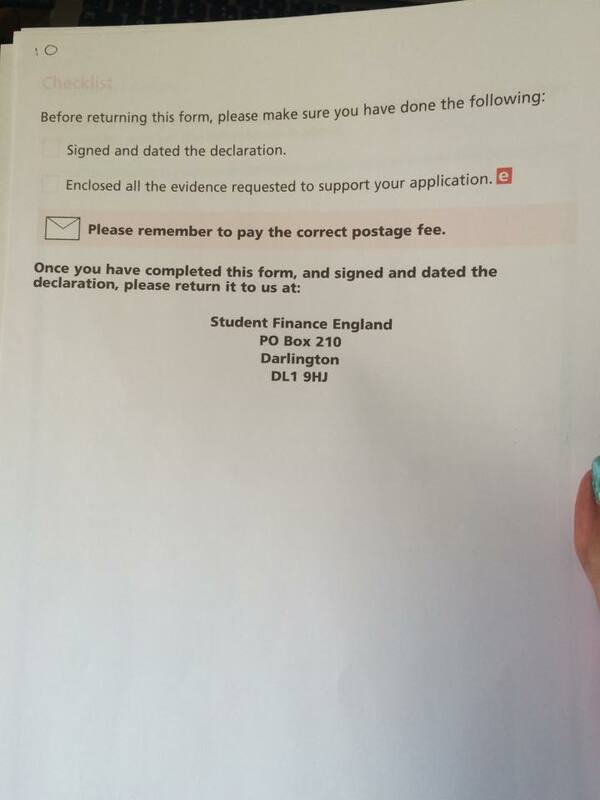 I also have a form for reimbursements, each month I send off a form to SFE to be reimbursed for items such as printer ink or my course books or travel to university by bus or taxi. I must provide receipts for all of these things to be reimbursed. I’ll make another guide to reimbursements in the ‘University Life’ section of my blog. Any other questions? Tweet me: @Blogguin and I’ll try to help you as best as I can! Once you’ve completed this, congratulations you’ve graduated the class of DSA at the University of Beth! I’ve numbered the pages. Page one actually starts from ‘Section One: Personal Details’ and not the boring writing bit that you roll your eyes at when you turn over the front page! Customer reference number: it is the 11 digit number SFE assigned to you when you first applied and you can find it on the top of any letters sent to you by SFE. If you don’t have those letters handy you can find it if you log in to SFE and it will tell you under “*Your Name’s* account”. Having this is on your application is extremely important! Date of Birth is in Day/Month/Year format. ‘Have you ever had any other loans from the Student Loans Company (SLC)?’ means have you got other loans such as maintenance and tuition fee loans coming to you from SFE. If so, tick yes! 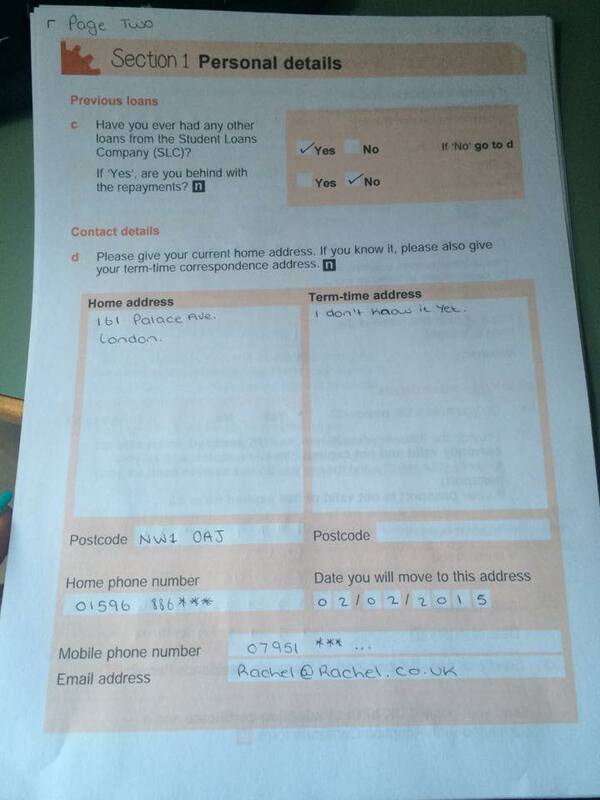 ‘If ‘Yes’ are you behind with the repayments?’ – If you are currently receiving the loans tick no. Term time address: if you don’t know it yet, just make a little note that you don’t know it yet. Undergraduate section – Student that has not yet graduated. So if you are an Undergraduate you do not need to fill out the Postgraduate section. A1) NHS Bursary funding is typically available to those training in a profession that could lead to an NHS job. 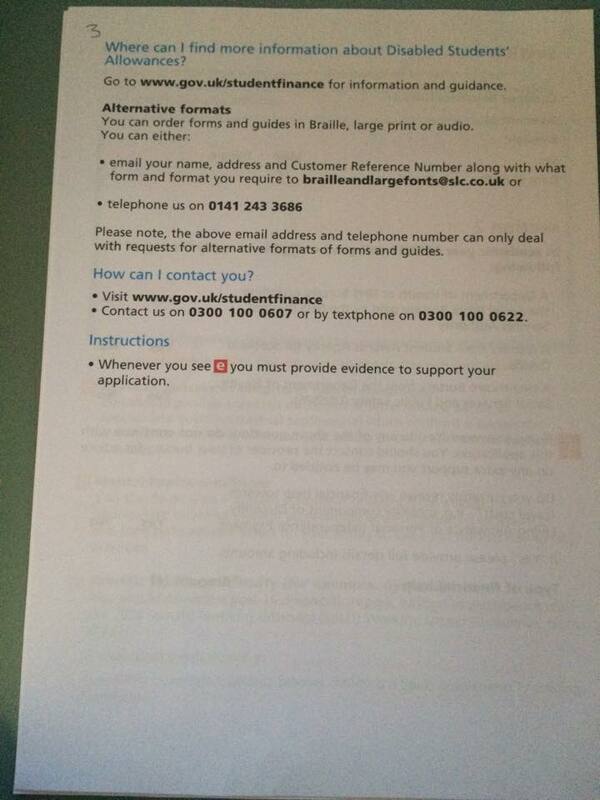 A2) From my understanding you must be studying a course supported by this agency and a resident of Scotland. A3) DHSSPS typically available to those training in a profession that could lead to an NHS job. 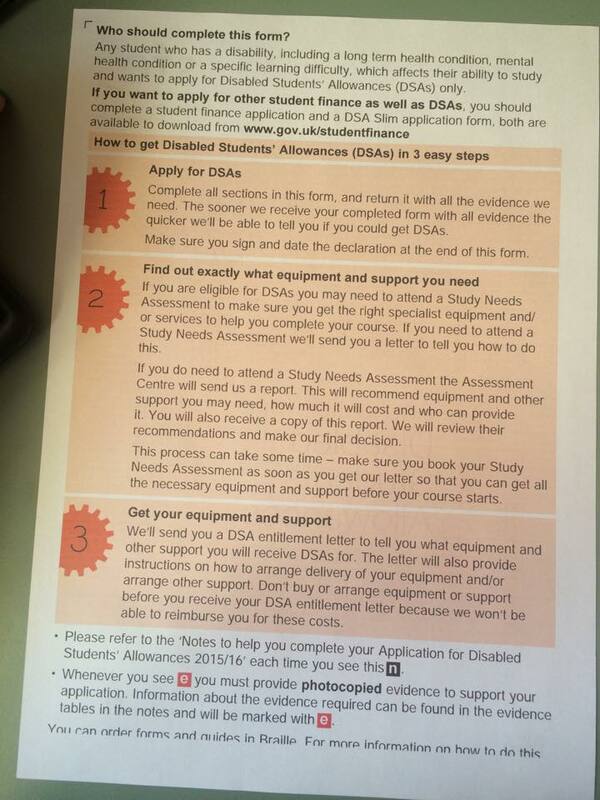 If you don’t know you must find out before applying for DSA. 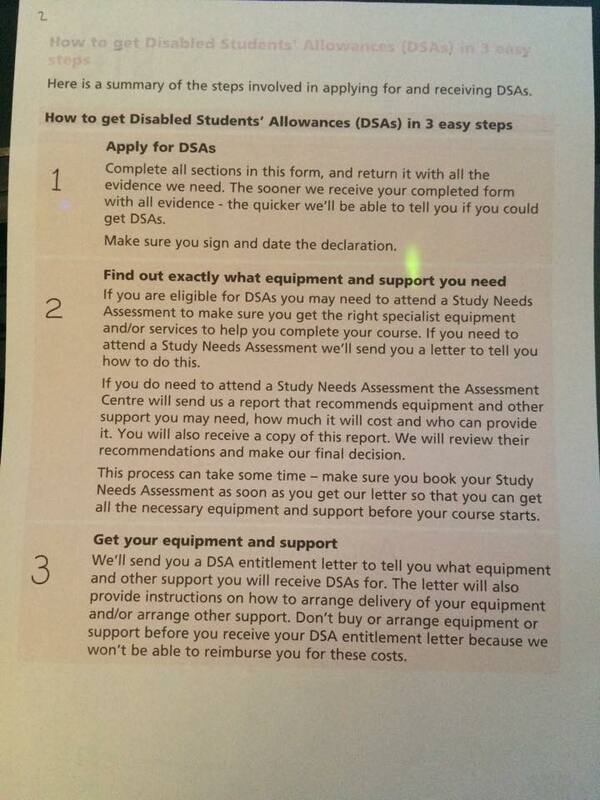 If YES to any of these you cannot apply for DSA. If you don’t know what these are, you’re probably not eligible for them. Postgraduate section – Student that has graduated. 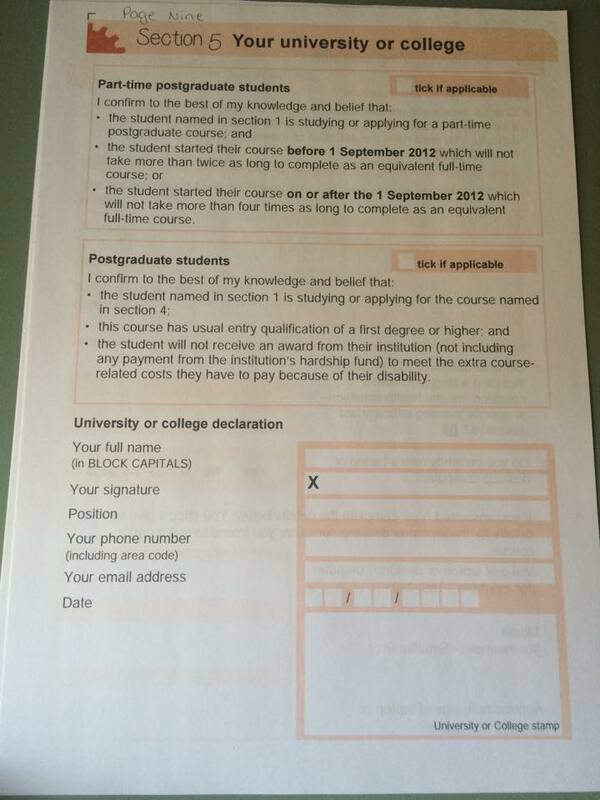 So if you are a Postgraduate you do not need to fill out the Undergraduate section. 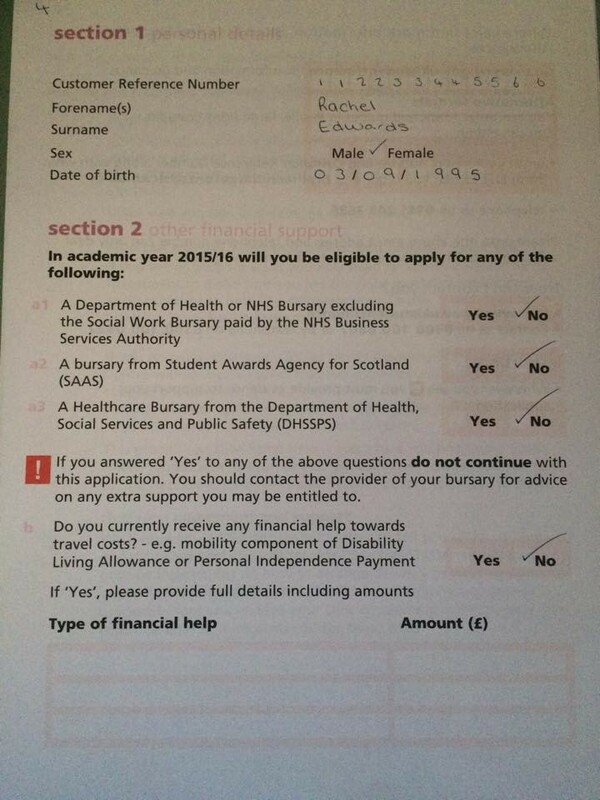 B1) NHS Bursary funding is typically available to those training in a profession that could lead to an NHS job. B2) See Research Council’s website. B4) Funding from the institution you are studying at. 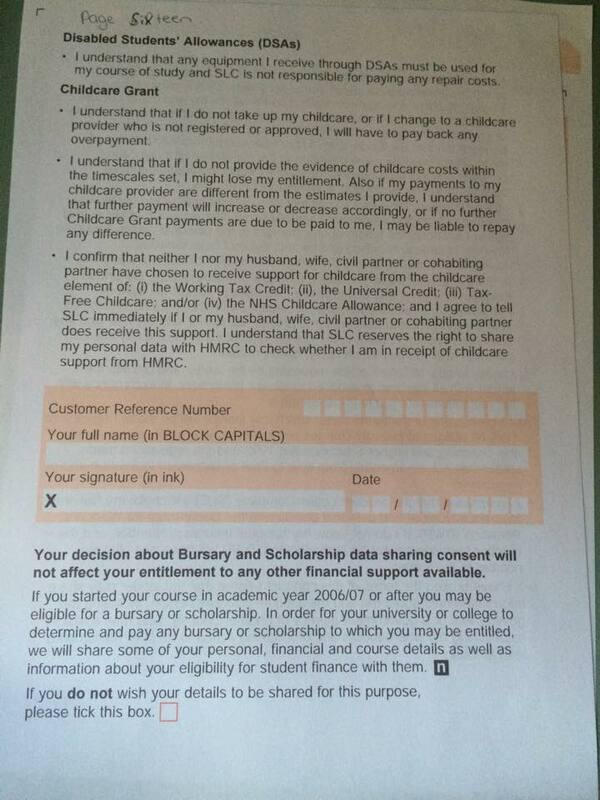 C) Are you given any funding from other bodies, such as the council PIP funding. If yes, write how much and which funding body gives you it. 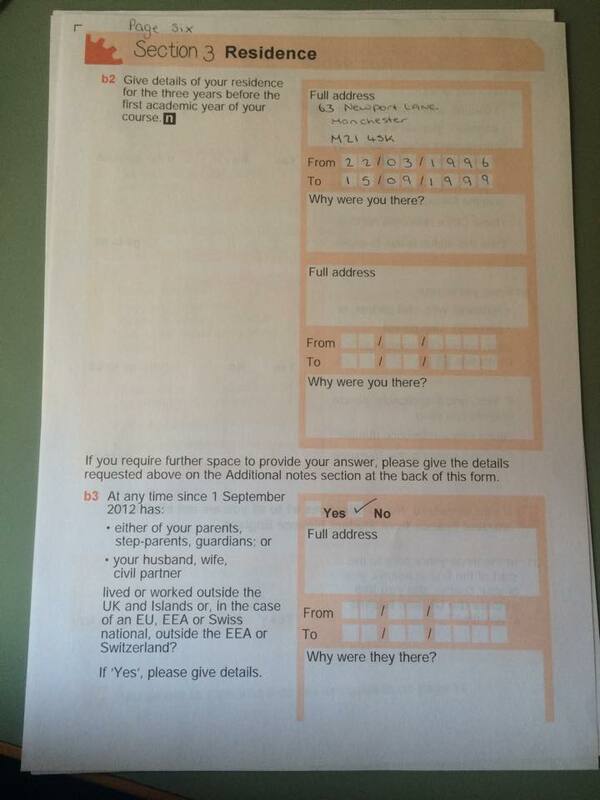 If you are a UK citizen tick ‘yes’ to A1 and move to section B1 on page five. The instructions for A2/A3 are very straight forward. 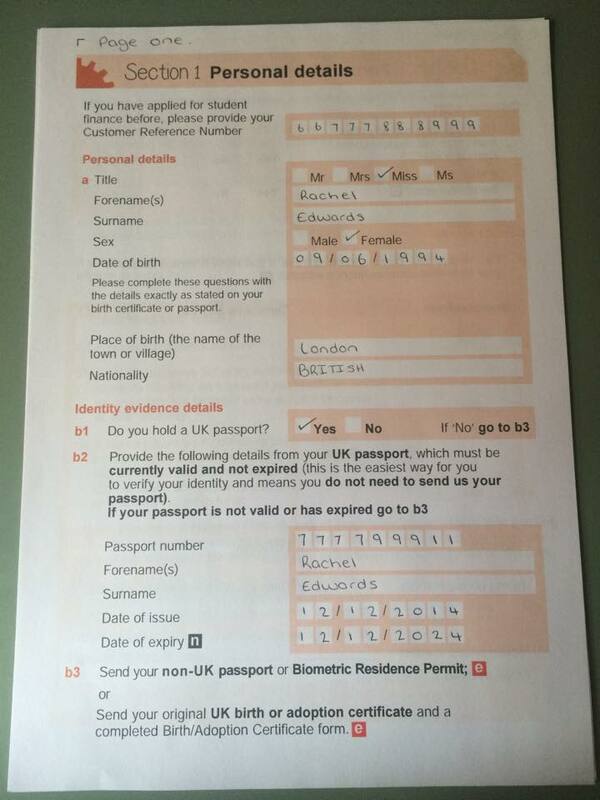 UK citizens only need to complete B1 on this page. 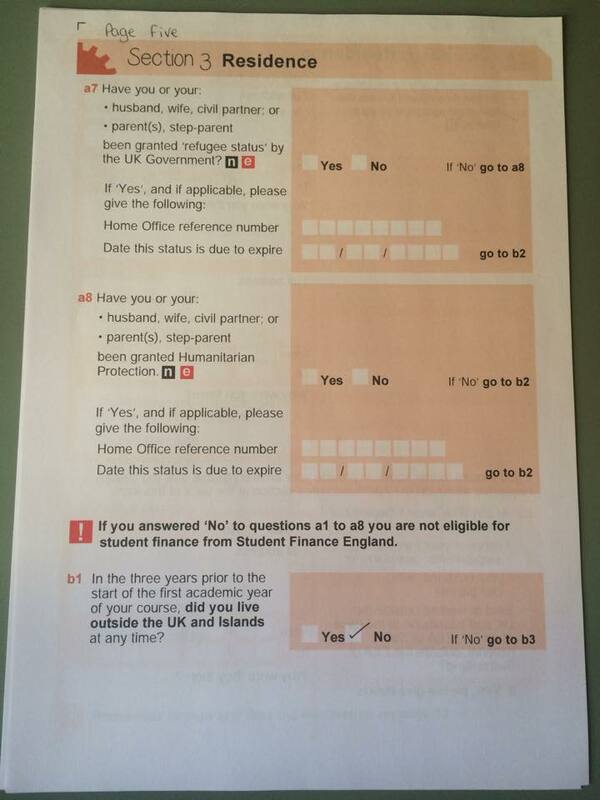 B2) UK residents that have always lived in the UK need not answer this and move to B3. 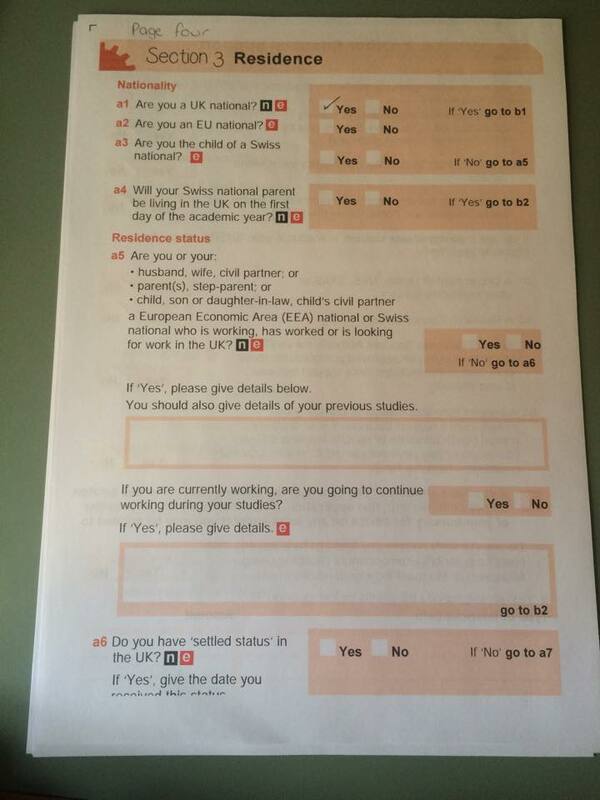 B3) Have your parents/guardians worked in a different country, one that is not in Europe. A) Your university/college address and name. B) Name of the course you are studying at university. Write in the bigger box below the course name any other subjects being studied, for example you are doing a Joint Honours course. Under the bigger box, is a smaller box: What award do you get from it? “If the course is ‘franchised’ to another university or college…” this means if another university supports and funds the course, despite you being at a different named university. Example in the photo is that lovely Rachel is studying at the University of Hull, but her Music Technology course is funded by Leeds University. 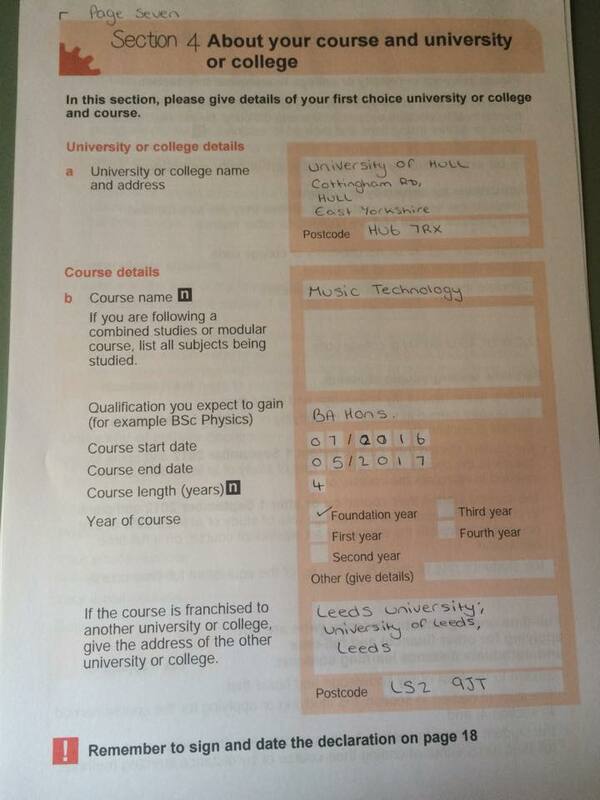 Do not fill these two pages out, you must find the appropriate person at your university or college to fill this out. 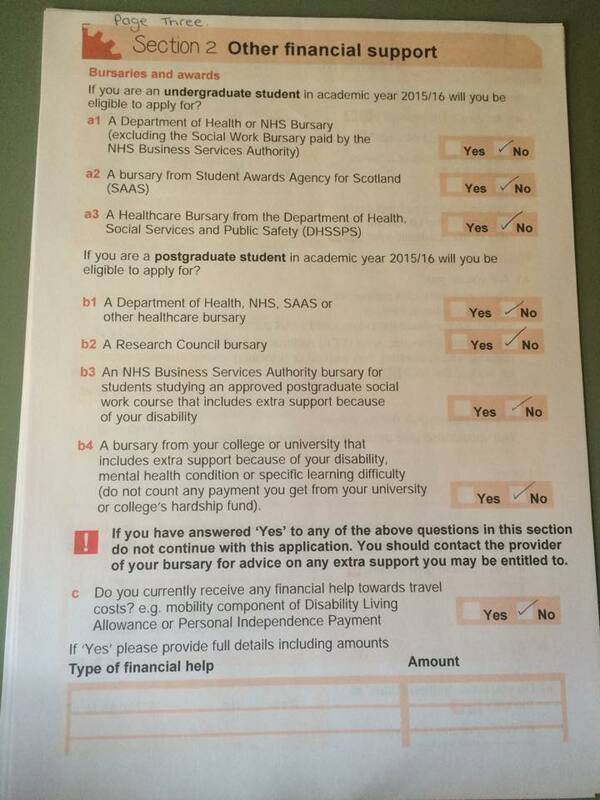 For example your university may have a student wellbeing service and/or disability advisor to fill this out for you. Write in the box at the top what your disability is, what it prevents you from doing, or how it makes studying a struggle for you. 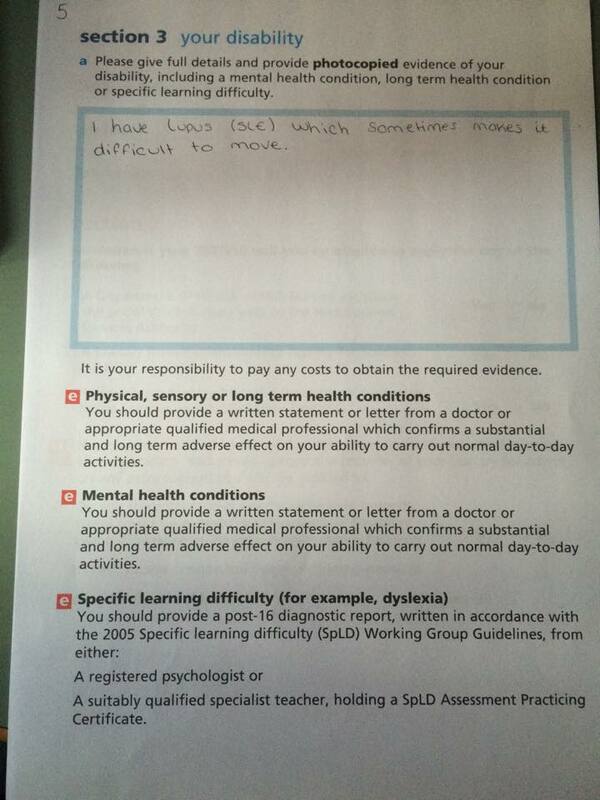 Also, this is the page to attach any doctors notes/medical evidence about your disability/illness. Straight forward consent tick boxes that must be ticked or else SFE cannot fund you. Straight forward bank details, often found on letters/bank statements or at the bottom of your debit card. Student declaration, confirmation that all information you have provided is correct. 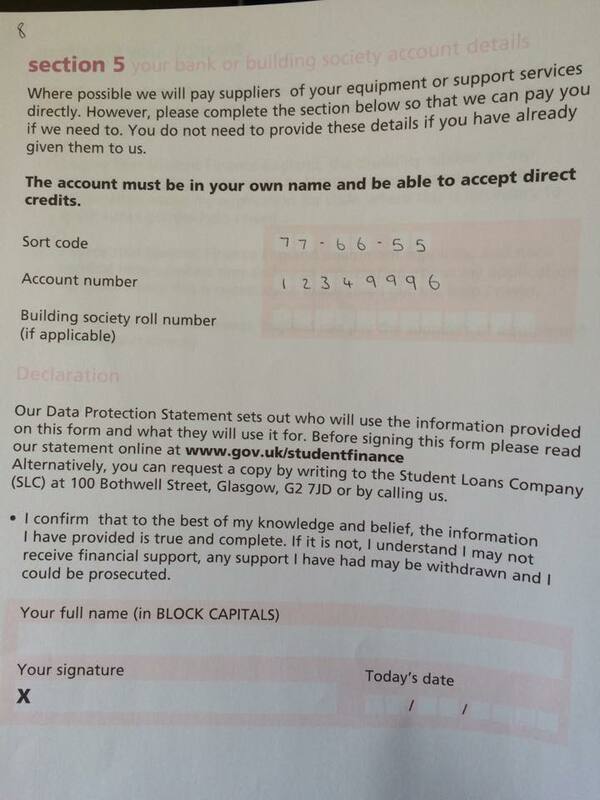 Customer reference number, your full name in capitals and your signature to confirm everything is correct. Tick the tick box at the bottom to opt OUT of data sharing with external companies. This does not affect if you get funding or not. Anything else to add that you couldn’t add earlier? Here’s the additional notes section just for that! Handy checklist to make sure you have everything SFE need to process your application and to ensure you don’t miss anything! If you’re looking for the short DSA guide, or the Slim DSA guide look below! Page one: Your front page should look like this, and be titled DSA Slim. Page three: information page/alternative formats for the DSA short application. B) I have always put the date of my last doctors appointment in this section, but I feel this might mean when you were last assessed by the DSA assessor. I’d imagine either are allowed as I have never been rejected on this basis. 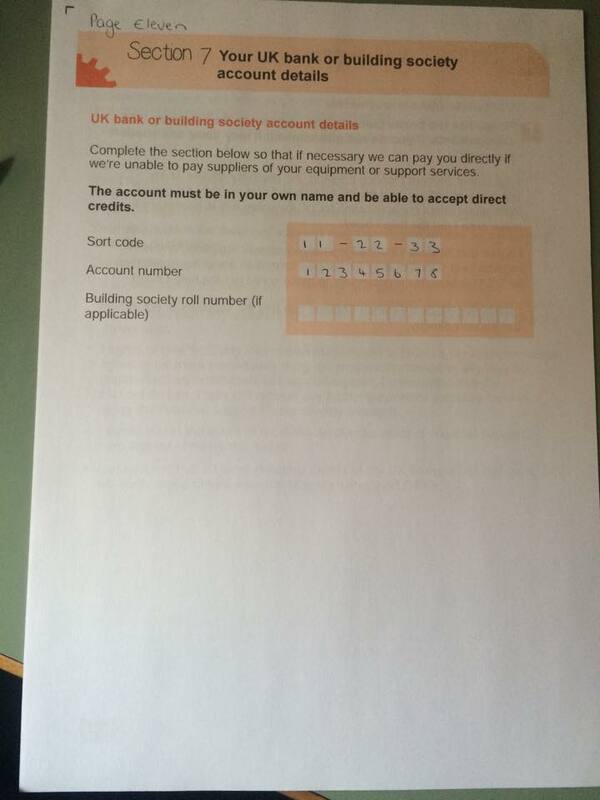 Straight forward bank details, often found on letters/bank statements or at the bottom of your debit card. Also the student declaration, confirmation that all information you have provided is correct.